Over the February break (an unexpected privilege of working at a private school) I had a truly transcendent day. It started out rainy, but broke enough for me to meet Kyle for some waffley goodness at the Farmer's market. I then went to the main library and did a little research on where my great-grandparents lived in the 1920s and 30s. The family story is that like all good Italians they lived in North Beach, but one time my grandpa said that he went to catechism in the Bayview. When I asked why he would go from North Beach to the Bayview for catechism he said that they lived there. Turns out for three years in the 30s they went from living in an apartment to a house in the Bayview. A few years later they returned. You go, City Directory! My last stop in Civic Center was in the knitting and sewing sections of the library. 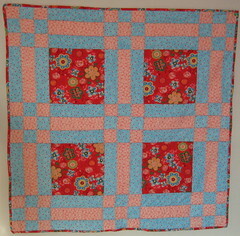 There I found Even More Quilts for Baby: Easy as ABC, an amazing guide to creating baby quilts. Ursula Reikes walks you through exactly how to cut, piece, and assemble 20 baby quilts. That afternoon I cut out the pieces for a quilt and by the next day the quilt top was assembled. 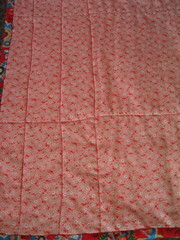 A few weeks and a walking foot later, I had made a Triple Rails quilt for a co-worker's impending daughter. Two of the fabrics might be familiar from my first quilt, but the construction and placement make for two very different quilts. Since then I have purchase all three volumes of Reikes Quilts for Baby with plans to keep practicing as long as my friends and family keep procreating. Then, maybe, I will move on to something bigger. In the meantime, this is hobby is a mean fabric stash buster. A couple of months ago Harold and I started a podcast about television and how we watch it, but it is also about ranting and nerding out. 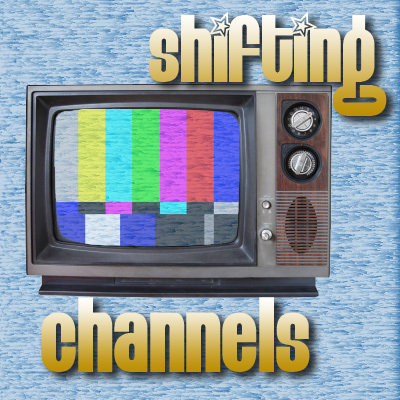 It's called Shifting Channels (link corrected!). Check it out. And the genetics goes to . . . Thanks to series of knitterly links, I ended up at MyHeritage today (thanks to Kim of Yarn Abuse for providing the final link in the chain.) By uploading images from my Flickr, I found out that I look like a Bollywood actress, a well-respected star of stage and screen, a famous telepath, a controversial filmmaker, and the Ghost Whisperer (also on the list David Schwimmer, Sharon Stone, and Andie McDowell). The best that I can tell is that my angle and expression vaguely match the photos of these celebrities. When I did this for John his #1 lookalike was Elvis Costello. It might have been the glasses or perhaps this says something about my taste in men. 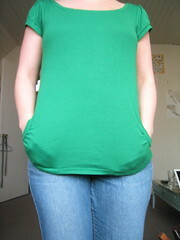 My new favorite t-shirt has pockets. A shirt. With pockets. It is pretty much the best shirt ever. It's from Old Navy, but I can't find it on their web site. If you told me when Henry Ian Cusick uttered his first "brutha" that Desmond would become my favorite character on Lost I would have never believed you. I am not someone who is going to go on about the subtleties of performance or nuance. What I love about Desmond has nothing to do with nuance. This is a character that wears his heart out on his sleeve. He's the only one who tells the truth. Simply, he is the only character with any character. The rest of those fools just wander around worry about their own damn selves. Desmond is the only one who seems to have a purpose larger than self. He also might be the only reason that I am still watching a show about a plane crash with smoke monsters, ghosts, chemical warfare, time-travel, but no discernible point. Who knew something so simple, could make Garfield so funny? I have started a thread on Ravelry about this if you want to join me. This is cross-posted from there.